There are currently 116,843 users on this website. I'm thinking that it's just some type of illusion. Although, I see what you mean. It is just an indention, caused by something moving downward while pressing into the thin plating outlining the face. Sure didn't come that way from the mint. In other words, something damaged your coin Post Strike. 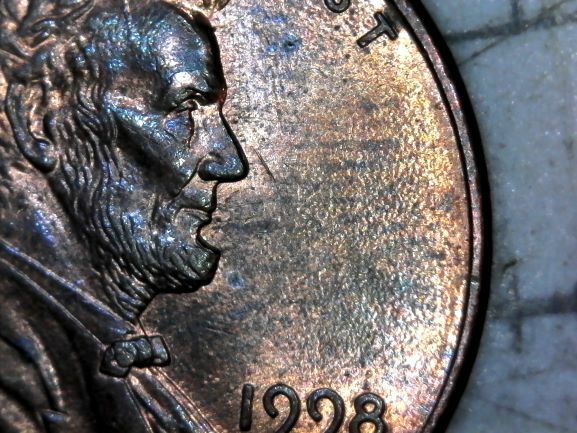 It's Post Strike Damage ( PSD), meaning that this happened after it left the U.S. Mint. with all do respect Guys you can't spin what I see on this coin... It had to happen there because it's etched into the coin... I swear... it's there!! Let us know the results from submitting it! @PH1, I definitely see what you are talking about. I see what appears to be most of the nose, upper lip, and part of the lower lip seeming duplicated below and to the right of the actual design elements. One problem is that these "ghost" images are inset (below the surface) rather than proud. I don't see how this could have happened as part of the minting process. 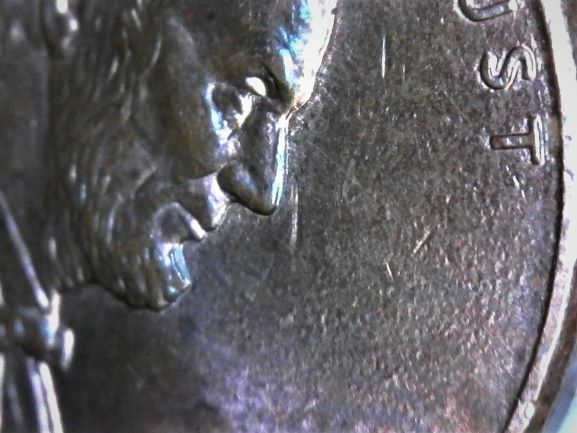 Rather, the much more reasonable explanation (as noted above) is that this is just weird damage to the surface of the coin that happens to almost perfectly mirror Abe's face. Of course, you can send this coin in to get it professionally examined and if you choose to do this, please note the results in this thread. It would be great to hear back from you regardless of whether we are right or wrong about your coin. Thx. If I tilt my head just right, close my left eye, squint my right eye .... I think I can see what you are talking about. I have no idea what it is though. I can see what you are referring to quite clearly. I am wondering is this is a plating bubble. However, this is not a doubled die obverse. I didn't know that Jefferson nickels were plated.